I gotta admit that I was a bit hesitant to write this post. You see, Mr. Mikes had sent me a media package with gift cards, information and an apron over a month ago. Nice apron by the way... The purpose behind this was to help promote the their Mikeburger Madness. For every Mikeburger sold at all of their locations until August 29th, 2010, $1.00 will be given to local charities. For me, I'm a sucker for anything that involves a good cause. That's why I posted White Spot's Pirate Pak Day immediately without hesitation. However, I was torn with Mr. Mikes because the food did not necessarily impress me the last time I visited the Surrey location. Unlike my undying attachment to White Spot burgers (despite not really being close to the best), the Mikeburger is a bit forgotten. I do remember eating it as a kid at the ol' skool Mr. Mikes complete with salad bar. There is no mistaking it due to its large patty sandwiched between a garlic loaf. A follow-up email (indicating that the promotion was ending soon) got me off my rear end and I headed off to the Coquitlam location. You see, it really did make a lot of sense to me. If I can promote White Spot's charitable cause, I really should do the same for Mr. Mikes. Consistency is golden. So I grabbed the family and went in with an open mind. My son went in with a closed mind because, well... that's just the way he rolls. Located in the former digs of Moxie's, Mr. Mikes has gone upscale and larger. Gone is the salad bar and dingy decor. In with the "Cactus Club" ambiance. Surprisingly, the place is kid-friendly, complete with a kid's menu and crayons. 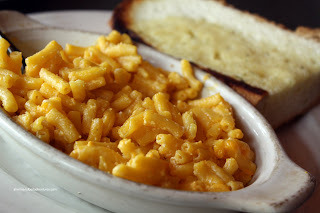 My son, with his closed mind, went for his standby being the Mac 'n Cheese. 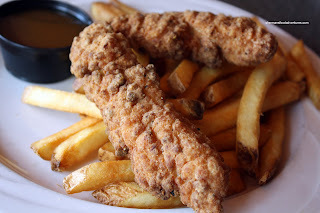 My daughter, for some reason, chose the Chicken Strips. I don't think she even ate any. Last time we let her choose! Each meal comes with a choice of beverage for $5.99. 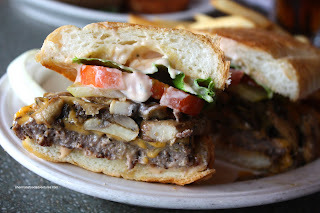 Of course, being that it is Mikeburger Madness, I decided on the Mushroom Mikeburger. Honestly, it wasn't too bad. The darn thing was massive and lots of mushrooms to boot. I'm not a big fan of "cutlet"-type burger patties; so I'm biased. But it was did the job. Since Mr. Mike's is a steakhouse, Viv went for the Grilled Ribeye. 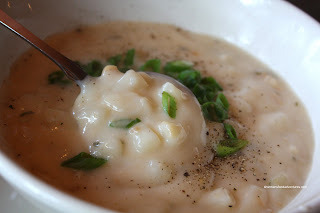 She started with a bowl of Clam Chowder (included in her combo). Very thick and chunky, the chowder was decent. Seemed to have a strange tang to it though. 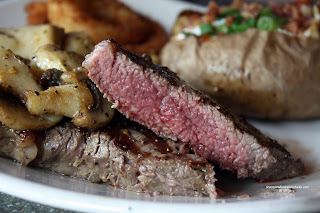 Unlike the last time at the Surrey location, the steak was cooked perfectly medium-rare closer to rare (which is the perfect way in my opinion). Yet, just like the last time, it was not that tender. They need to look into that. The combo also added a tonne of mushrooms on top. Onion rings and baked potato served on the side. 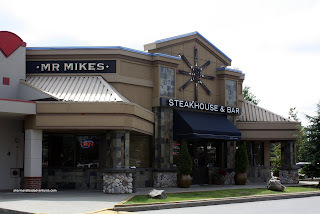 Once again, I have mixed feelings about the rebooted Mr. Mikes. Price-wise, other than the steaks, Mr. Mikes is less expensive than most of the other chain restaurants (of the same type). The Mikeburger is decent for the price, as with the kid's menu. However, I'm confused with their steaks. Am I unlucky twice? A $20.00 steak should not be chewy. I realize that Mr. Mikes comped me for this meal and I appreciate it. Yet, I have to report what I experience. I hope this can be taken as constructive criticism on their part. But to get back to the main reason for the post. If you want to have a Mikeburger and donate to charity, then head over before the end of August 29th, 2010. 37% rating on urbanspoon? ouch. i think the problem with this type of place is that there are so many and they're all relatively the same. boring! good on you for giving it a chance though. it makes me wonder if they noticed that you blogged about them before. it's quite sad that they rely on bloggers for publicity and don't take notice why they are failing. Trisha, the rating is probably a result of what is essentially average food. In such a competitive climate and with the HST, you need better than average food. Haha, I wonder if they read my previous post too! If you knew anything about steak you'd know that the ribeye is a marbled steak and less tender of cuts. It is known for having lots of flavour, not so for being tender. If you wanted a tender steak you should have gone with the sirloin or even better, the filet mingnon. With all due respect to the previous comment. I do know that and as such you are assuming. I was about to delete your comment, but I decided to answer because you are merely stating something that is an assumption. I grill steak all the time at home on my Weber. I know steak. Despite that Ribeye is not as tender as say a striploin or tenderloin, you have to realize that it shouldn't be super chewy either. In this case much like the last time, it was. So unless you like to be gnawing on a steak when you have just paid $20+ for it. Then you might have a point.